Standard & Poor’s looks in the first instance at a government rather than at political parties. I can’t find the statement freely available, but here are articles by Michael Janda at the ABC and by Jacob Greber and Phillip Coorey in the AFR. There is a one-in-three chance that we could lower the rating within the next two years if we believe that parliament is unlikely to legislate savings or revenue measures sufficient for the general government sector budget deficit to narrow materially and to be in a balanced position by the early 2020s. In the print version of the AFR an extract of their statement points out that the first planned surplus was to be in place through the 2012-13 budget. Since then the can has been kicked down the road each year, by Wayne Swan in 2013 to the fourth year of the forward estimates, and since then to just beyond the budget estimates. It moves forward one year each year. S&P have blown the whistle in that little stunt. They say that if we get a surplus in 2020-21 as now promised it will be 8 years after it was first scheduled, and over 10 years after the GFC which caused it. They are happy with that, as long as it happens, and steady progress in terms savings and revenue are demonstrated to that end from now on. The first problem is that they’ve noted our political instability, and the inability of any political party to control both houses of parliament, so they want to see the government perform in that context. Here I’ll mention three opinion pieces or explainers – Michael Janda at The Drum, Jacob Greber at the AFR, and Robert Guest at The Conversation. The biggest issue by far is our net foreign debt. Government debt is deemed to be “low” but the concern is with private debt, mainly as Michael Janda says, houses and holes. The holes, ie. mines, should be fine if they lead to “productive investment opportunities”. However S&P expect the price of iron ore to be $US20 per tonne, not $US55 as the budget assumes. My eyes blinked at the $US20 per tonne figure, but I’ve seen it in several places. I’d guess that at that price the whole industry in Australia would be uneconomic. There must be cheap mines coming on stream elsewhere or demand is tanking. Either way that alone would cause both a credit downgrade, and probably a recession. The dollar may plunge to save us to some extent. Treasury forecast that a $US10 per tonne fall in iron ore prices could wipe $1.4 billion from Commonwealth revenue this financial year and another $3.9 billion next. Australian bank liabilities to foreigners have now topped a trillion dollars, about double what they were in 2007 before the global financial crisis. Foreigners owe Aussie banks about $600 billion, leaving a net overseas liability of more than $400 billion. Given that almost two-thirds of bank loans are for housing, there’s no doubt that hundreds of billions of dollars of foreign money is invested in Australian bricks and mortar – overwhelmingly via Australian households, not overseas property investors. 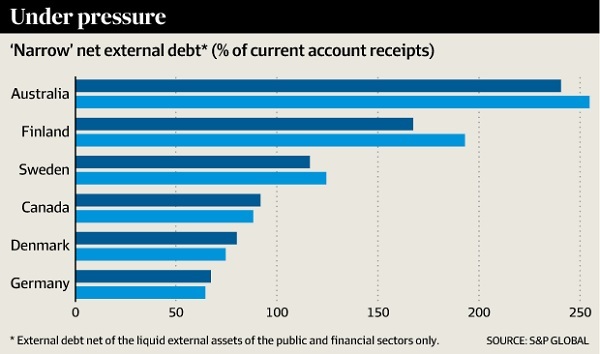 S&P associate director Anthony Walker told analysts and reporters on Friday that there has been deterioration in a key measure of the serviceability of Australia’s external debt – the ratio of how much it needs to refinance from offshore over what it earns in foreign currency. AAA-rated countries normally keep that ratio below 200 per cent. 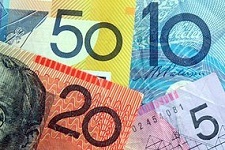 Australia’s is already above that and headed above 300 per cent, the agency said this week. At this juncture I’ll point out that the risk S&P are rating is the risk of the government defaulting on its debts, which economists reckon at effectively zero. Still S&P are a company making money for their shareholders and have to look as though they are doing something. I’ll leave others more qualified to comment on their role in the world, but they were the ones who positively rated the junk-bond infested securities that caused the GFC. So what will the government have to do? In the first instance they’ll have to decide how they negotiate the senate. So far they’ve been courting the crossbench, but Turnbull so far has not met with Jacqui Lambie or Pauline Hanson. We won’t know the degree of difficulty he faces there until the senate count is done. It looks as though he won’t, in the first instance, seek the co-operation of Labor and/or the Greens. I’ll detail briefly some of the difficulties Turnbull has to face. First, there are the assumptions on which the budget rests, the iron ore price, the fanciful assumptions about growth etc. Chris Bowen criticised these from the outset and promised to revise them immediately if he got the gig. That aside, they’ll have to be revisited in the mid-year review (MYEFO) because the government needs to establish credibility with S&P and with everyone else. Second, the company tax cuts. For companies up to $2 million there is bi-partisanship. Turnbull/ScoMo may stretch that to $10 million with the crossbench. But they’ll have to show credibly where the savings come from. During the election campaign Turnbull told us that major companies would anticipate the tax cut, and figure it into their investment plans. Hence this would generate the jobs and growth to pay for schools and hospitals and other good things. Even ‘expert’ supporters of the taxes said it would take longer. This was effectively a porky. He has to do better. Clearly the effect of the tax cuts will not save the budget in the next four or five years. Third, he’s going to have to deal with the socalled “zombie savings”. For three years now they have been there propping up the bottom line with no prospect of passing the senate. He’s either going to have to get them passed, or abandon them. Fourth, he’s going to have to either tangibly support Medicare and related health measures, which will cost billions, or admit that Labor’s concern was justified, if not the means by which they prosecuted their case. If he doesn’t come through with tangible support, he should abandon the language of Medicare being a safety net. People needing help will miss out. Fifth, Turnbull will have to face up to his underfunding in the forward estimates of hospitals. Laura Tingle has repeatedly called out both sides on this. Labor threw in a few extra billions, but not enough. Sixth, Turnbull will have to convince Nick Xenophon that he has a plausible plan to ameliorate the effects of the termination of the car manufacturing industry. All three are winding up in 2017. Jay Weatherall has opened the resources of the whole SA public service to support Xenephon in his role of looking after SA. Seventh, most likely The Nats will demand the abandonment, or substantial dimunition of the backpacker’s tax, as the price for the Coalition Agreement. From memory there was over $500 million sitting there on the revenue side of the budget, which Labor also conveniently left sit. Finally, there will need to be a resolution of the notion that all revenue shortfalls will be matched with further expenditure savings, the line that Scott Morrison has been putting firmly post-election. There should be further thought about increasing the Medicare levy, which should be a no-brainer, and the deficit levy on the rich. Stephen Bartos and others have suggested that negative gearing be revisited, but Turnbull would then have to admit that his scare campaign was rubbish, which it was. Prof John Freebairn on Radio National suggested a land tax to replace stamp duty and raise extra revenue. A land tax, he says is not distortionary. He then suggested that at some stage the GST would have to be revisited. I’d expect that the ScoMo line will prevail. The Senate odds and sods would be irrelevant if the Coalition and Labor could agree on measures to deal with the Budget’s structural problems and protect the nation from a credit rating downgrade which would reverberate through the economy. Don’t hold your breath, though. The temptation for the Coalition will be to hang tough, governing as though it has a majority in both houses by putting forward the policies it favours and refusing to compromise. “Then, if you can’t get it done, you call another election,” a Liberal MP said yesterday. The alternative, he believes, is to “negotiate with everyone and have your policies sliced and diced”. The temptation for the Labor leader will be to emulate Tony Abbott’s strategy after the 2010 election, opposing everything with the aim of destabilising the government. Shorten seemed to be preparing the way for such an approach on election night when he suggested Turnbull had lost his mandate but voters had given a mandate to Labor. Political cynics, of course, will brand this column naive. Unfortunately, they are almost certainly right. On mandate, I think that since Meg Lees and the Democrats gave us the GST voters do expect the way they vote for the senate to make a difference. There is bipartisanship on security matters generally, on turning the boats around, on offshore processing, and to a large extent on superannuation. That’s about where it stops and where it will stop. I can’t see Turnbull, or anyone who might perchance replace him seriously reaching out to Labor, and until someone does Labor’s response is hypothetical. Shane Oliver thinks there will be a credit downgrade. I suspect he’s right. The effects will ripple through the economy. Everyone with a loan will pay more. Our standard of living will take a knock. If S&P are right about the price of iron ore, I suspect we’ll have a recession, and probably will anyway. No-one voted for instability except, as Margo Kingston said, some voted for Pauline Hanson, not knowing what she stood for, just to “blow the place up”. Politically, that is. The sky is not as well propped-up as one would like. However, we voted, got a result and have to start from here. The danger here is that the threat to the AAA rating will be used by government and opposition to attack each other. The threat may also be used to justify decisions that aren’t really in the countries interest. It may be smarter to let the credit rating slip a bit. What is the predicted impact on the cost of borrowing of a rating drop Brian? Geoff, when I looked at this more closely, the main game is indeed the budget bottom line, which S&P are obsessing about. The real problems in the economy, however, lie elsewhere, as they point out. Also I’ll say here that I’ve heard Shorten’s concession speech and Turnbull’s response. Nothing changes in what I wrote. John, I don’t know, to be honest. I remember when Keating was treasurer and they downgraded us, he told them to bugger off. Seems there is a problem in how we do our accounting and present the budget. This article suggests we should just show an operating budget and keep infrastructure spending off the books. What happens now doesn’t happen everywhere in the world. It’s an artefact of how the states relate to the Commonwealth. So the chooks are coming home to roost – and the convenient scapegoat is one mediocre ordinary nationalist in our time. Of course, nobody would dare blame the real culprits: Sir Robert Menzies, his semi-business pals or the pretend-graziers in the old Country Party (now the Nationals or the LNP). We are in desperate need of real leadership – yet all we got out of the latest election was a “state-of-origin” faux-contest without footballs. Suggest we all have heart-to-heart talks with Greek migrants here and find out how their relatives coped with the “interesting times” Greece experienced so recently. In the absence of political leadership in Australia, we will need all the hints we can get for surviving one financial turmoil after another in our everyday lives. Yet Swan had Iron ore, Coal and gold at record prices an went backwards quicker than our coxless four in Atlanta 96. Part of the problem now is that John Howard used the revenue from the mining boom to reduce taxes and win elections. No-one has the guts right now to say that the party is over and taxes need to go back up to the levels they were before the boom. Jumpy, that’s why he thought he could bring in a surplus. It wasn’t his fault the prices went down, down lower than forecast by Treasury and Finance. It would be good if the filthy rich and the foreign firms actually paid more than a token amount of tax – but if that actually happened, the so-called credit agencies would freak right out give Australia a triple-Z-minus rating overnight. Still, given the history and tactics of these organizations and their pals, that might be a damned good idea for us. Exactly the same logic applies to corporations. The investment policy required to maintain a AAA rating is so conservative as to ensure that many profitable investments are foregone. Only two US corporations (Microsoft and Johnson & Johnson) now maintain AAA ratings on their debt. Microsoft has recently chosen to risk a downgrade by purchasing LinkedIn, a step that makes obvious business sense, but implies a need for more debt. Soon, AAA-rated corporate debt will be nothing but a memory. There is one reason we might care about losing our AAA rating. It means that the government will pay a slightly higher rate of interest on bonds issued in the future than it would if we kept the rating and nothing else changed. The margin between AAA and AA+ bonds is typically 0.2 percentage points. Eventually, when our entire public debt is around $300bn, that will amount to an extra cost between $600m and $1bn per year, if nothing else changes. Of course, many other things will change. The last time Australia’s credit rating was downgraded, in 1986, the interest rate on government bonds was around 14%. Today, it is below 2% and falling. Whether or not our rating is downgraded, the interest rate will continue to fall along with rates around the world. That’s very helpful, DH, and answers John D’s earlier question. The difference is typically 0.2 percentage points, which doesn’t seem much. Clearly more damage could be done by not funding investments productive for our future. Quiggin scoffs at comparing Private debt to Sovereign debt normally, but he and The Kouk flipflop on if more or less is better depending the conservative policy they’re attacking. He doesn’t explain that Countries aren’t taxed, companies are, 30%. Or taxes are on profits and interest repayment are a deduction before tax. His congregation never question what he intentionally left out.